The weekend is here, tomorrow is my anniversary (sixth to be precise) and the second one with the baby around. Now at 17 months, he is learning things everyday and enjoying life to the hilt. Seeing him explore the world around him has encouraged me to do the same. Everyone of you must remember the one habit (for me it was an annoying habit, not any more), which each mom possesses: feeding the child (sometimes forcefully). Actually, once you are a mom you don't realize that it is not force feeding, it is just that a mom cannot live with the thought that her child is hungry. You just constantly seem to worry about, comes naturally once you are a mom, I guess. So, the first concern I had when I was about to resume my job, was the same "How will my child have milk once I am gone?" 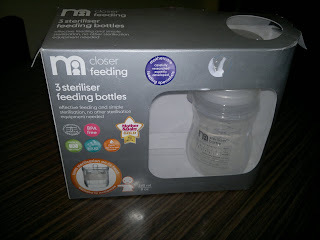 Of course, feeding bottles have been used since ages but then again how about sterilization? Maximum infections babies get is due to usage of an unsterilized teat. 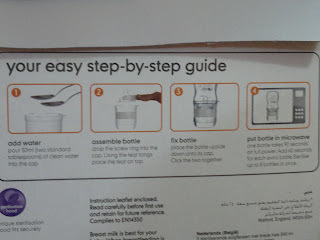 Moreover, I didn't want to burden my mom-in-law with the bottle sterilization. Already, keeping an infant alone for the whole day is a daunting task. 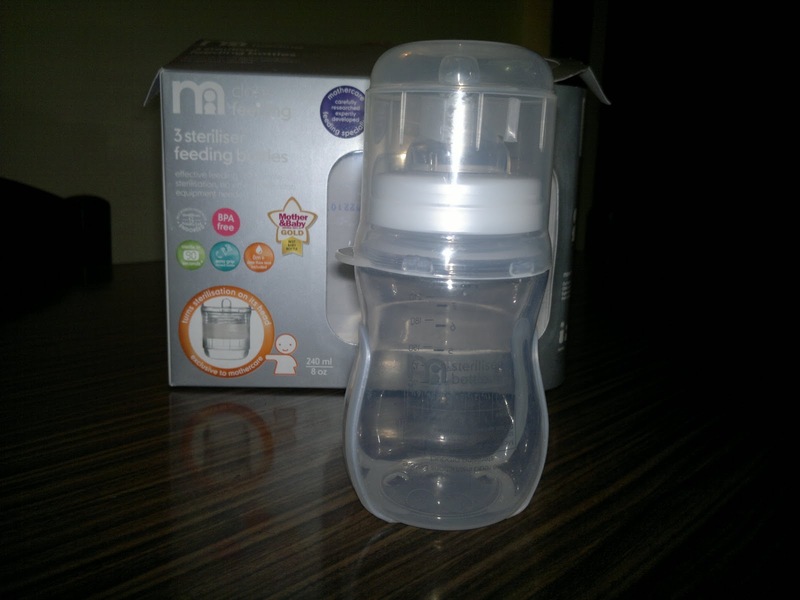 Second concern was that my Pedeatrician was against the bottle, so was my mom, and few other elders, who thought that the baby will leave taking mother's milk once it is fed using a bottle. Both of these concerns were solved in one go at Mothercare. I happened to visit mothercare before my baby was born to order stuff for the new one, such as blankets, cot, jump suits, and so on... 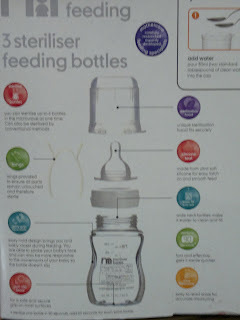 There, I found a whole section devoted to bottle feeding the baby. Didn't take much notice then. Later, when I was thinking of which bottle to buy, I went again there and lo and behold... The solution to both problems mentioned above was handed to me by a very helpful SA. He showed me the only feeding botlle (available in India) which could be sterilized in the microwave under 2 minutes. 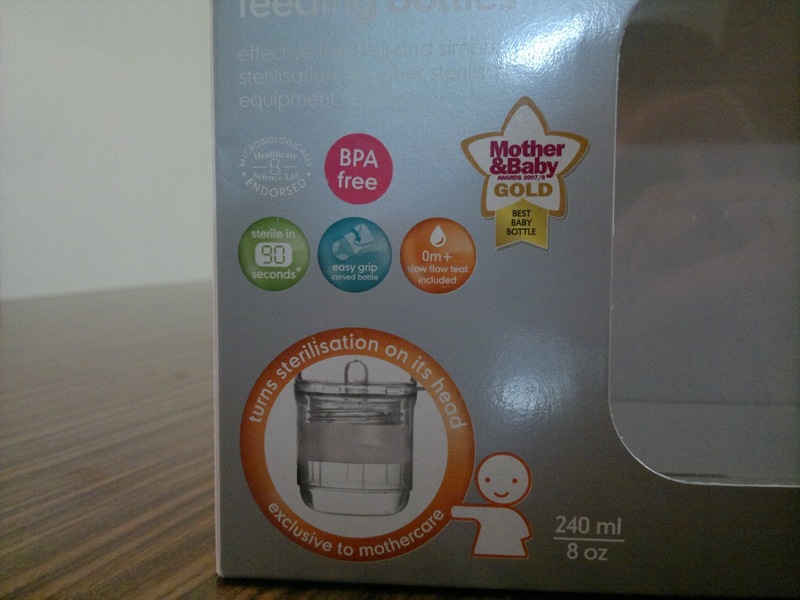 The MotherCare Sterilizer Bottle. I was over joyed on seeing it.I wanted to buy more, but sadly only one was available, but they said that the stock is coming so I got that home. 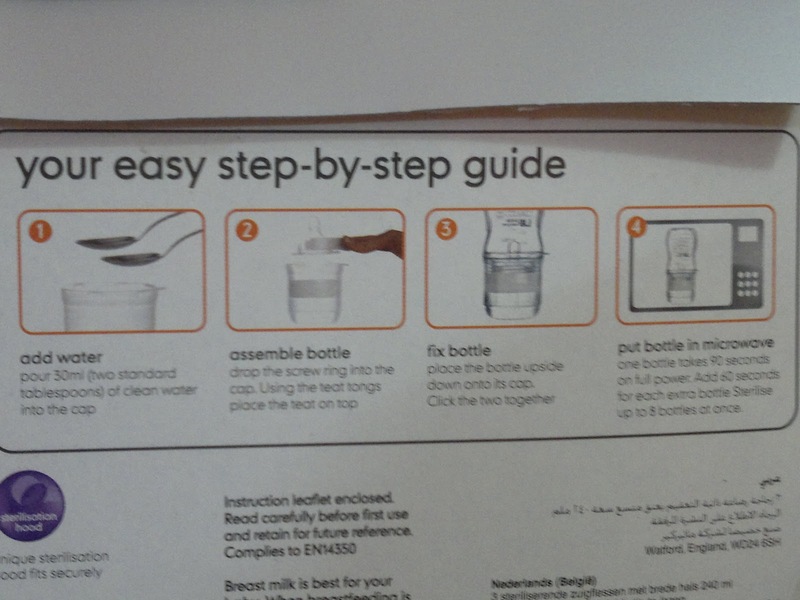 I taught my mom-in-law how to assemble the bottle for sterilization, it is very simple and she was only tooo glad to do it. We could sterilize it as many times in the microwave during the day, and the baby would be safe from stomach infections. 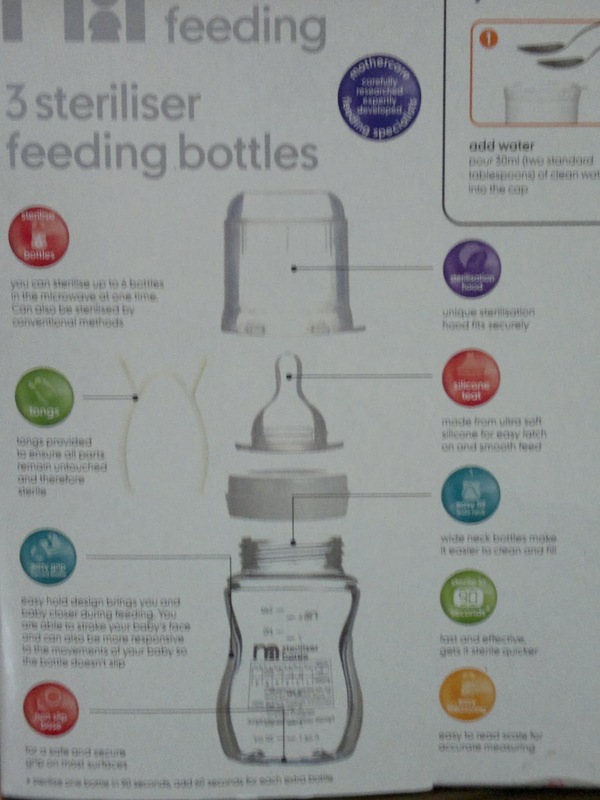 Moreover, at Mothercare they stock a variety of options in teats (slow, medium, fast, and variable flow) in keeping with the infant's age. Our experience has been very good with the bottle, so far that my child is 17 months old. Now, for the hitches we had. The bottle I got was the last in stock, and sadly they diddn't get any supplies till same time next year, but the bottle lasted us for a good one year and didn't trouble us at all, there were no cracks or anything. Teats were in supply easily and we just kept changing them. Price: It was INR 300 for a single botlle (back in 2010). Later in 2011, I got a pack of 3 bottles for INR 700. But, I would say the quality is awesome, sterilization is super easy, and keeps your baby healthy and secure. Many of you would ask now, did he still take mother's milk: so the answer is yes, no troubles at all, fed him easily for the first year of his life. Why didn't I look for more such bottles; I looked, and looked, and looked. Enquired everywhere, Chicoo, Pigeon, Avent (Philips) but no one had a bottle which could be sterilized so easily. So, we kept waiting for the mother care bottle. Would highly recommend it to all mothers. Product rating: A+ (available at all mothercare stores and also online).